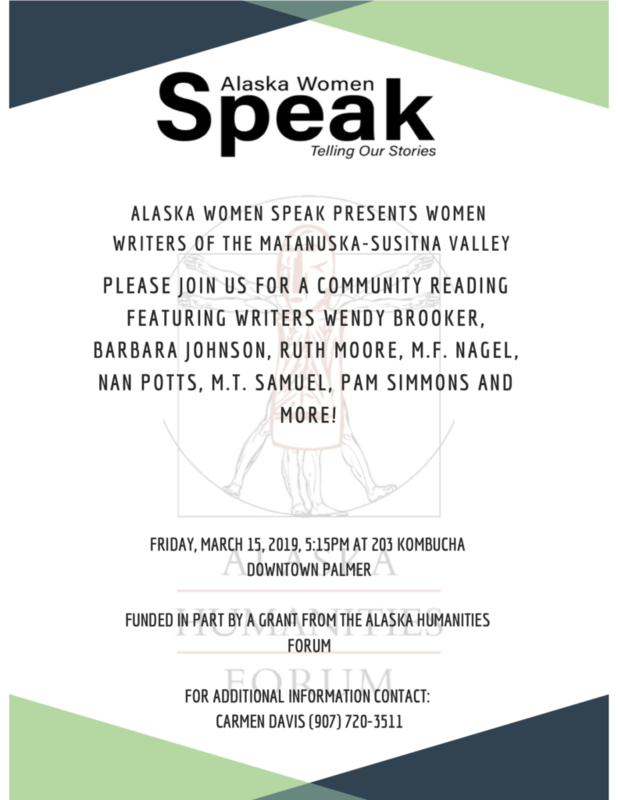 Alaska Women Speak presents: Women Writers of the Matanuska-Susitna Valley. Please join us for a community reading featuring writers Wendy Brooker, Barbara Johnson, Ruth Moore, M.F. Nagel, Nan Potts, M.T. Samuel, Pam Simmons, and more! AWS is pleased to announce that it has joined the Community of Literary Magazines and Presses! From the CLMP website: Independent literary publishers make up an underserved, uniquely vulnerable and essential field that connects the greatest diversity of writers to equally diverse communities of readers. Since 1967, CLMP has worked to bring these literary publishers together to form a mutually supportive community that is often at the vanguard of progress. CLMP provides technical assistance, facilitates peer-to-peer learning and group action, and builds bridges to connect diverse communities of literary stakeholders. Mix and mingle with fellow writers, listeners and readers following the reading. Thank you to our friends at The Homer Bookstore and our readers for making this event possible. Alaska Women’s Hall of Fame inductee Daisy Lee Bitter was nicknamed “The Field Tripper” during her 3 decades as an educator in Anchorage. Daisy Lee worked as a science and TV teacher, the Alaska Native programs director, and a school principal. Using her experience, she designed national award-winning educational programs here in Homer. Janet Klein has explored Kachemak Bay for the past 39 years and since retirement, continues to do so. She’s written non-fiction about the region’s cultural and natural history and is now taking classes and venturing into fiction and poetry. 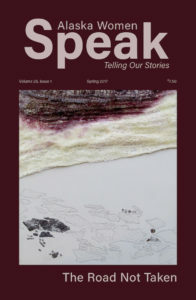 Janet will read “The Illusionist” and “Reimagining a Landscape,” both published in Alaska Women Speak. Milli Martin was born and raised in Los Angeles. She toured Europe in 1965 and came to Alaska in ‘66. Milli married an Air Force man and is the mother of two grown sons. Her family lived in Texas and Germany before settling in Homer in 1980. They “pioneered it,” working to build a home on their Skyline Drive lot. In addition to serving local organizations, Milli served 6 years on the Borough School Board and 9 on the Borough Assembly. She loves to write, belongs to a writers’ group, and is working on a memoir. She received the Friends of the Homer Public Library Learner of the Year award this month. Promised a job in 1981, Brenda Dolma drove solo from Texas to Alaska in her 1976 Buick. Brenda is now a retired educator who occasionally slows down enough to write more than journal entries. Most recently, she was motivated by the Homer Public Library Big Read and composed a one-act play called Home Sweet Home (R). Kat Anderson creates her art in the communities of Homer, Alaska; Ajo, Arizona; and Puerto Peñasco, Mexico. While her primary focus is poetry, murals, and one of a kind jewelry, she is also the lead organizing force behind Ajo Street Art Happening. Homer resident Marianne Schlegelmilch has written 10 books published by Publication Consultants of Anchorage and is best known for the Feather Series Alaska-themed mysteries. She created the popular, former Heart of the Alaska Nurse, a column for the Alaska Nurses Association, and is currently working in her preferred genre of fiction, writing a sixth novel.